Throughout this academic year I have been hovering around the Digital Humanities (DH), trying to see what it is all about and whether I might get involved. I have learned a lot from Fordham DH-pioneers Elizabeth Cornell and Patrick Burns, who lead the grad student DH group; I participated in the Digital Pedagogy unconference workshop at MLA; and I incorporated ideas from Cathy Davidson’s Now You See It into my classes. Finally, as of last week, I can say “I get it.” My former obstacle is now my motivational challenge: I am going to learn to code. Two inspiring events at Fordham last week have forged my commitment. The first was a lecture on “Teaching to the Network” May 1 by Matt Gold, an associate professor and person of many titles at CUNY, as well as editor of Debates in the Digital Humanities, a collection of essays published in 2012. Gold showed and described projects such as Looking for Whitman, which created “permeable classroom walls” and brought together students studying Whitman in New York City; Washington, D.C.; Camden, N.J.; and Novi Sad, Serbia. Gold’s other examples–including DS 106, a digital storytelling class; Dialogues on Feminism and Technology; and Davidson’s plan to offer a Coursera MOOC on “The Future of Higher Education”–drove home to me the point that DH can be connective, creative, subversive, and consoling, much like the literature I have read, studied, loved, and taught. I am a Romanticist, with all of the ambivalences and ambiguities that vexed term embraces. Call me parochial, but it was the Keats-Shelley Association of America symposium, “Romantic Manuscripts in a Digital World,” held at Fordham Lincoln Center on Saturday May 4, that–combined with Matt Gold’s lecture–made the value of DH unquestionable to me. 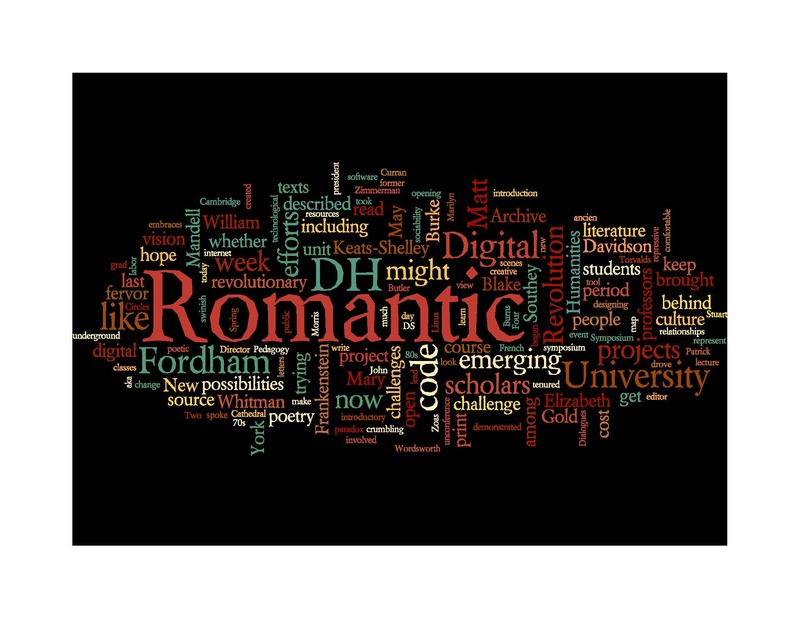 This event, chaired by KSAA president Stuart Curran and hosted at Fordham by professors Sarah Zimmerman and John Bugg, brought in teams of scholars to present three enormous DH projects in Romantic studies. Morris Eaves and Rachel Lee of the University of Rochester presented The William Blake Archive, whose inception predates the advent of the Internet. They shared the challenges that have emerged throughout the project, including the most recent efforts to decode and encode Blake’s manuscript “Vala” (aka “The Four Zoas”). Laura Mandell, Associate Director of NINES, and Lynda Pratt of the University of Nottingham described their efforts to digitize the 7000 letters of Robert Southey on Romantic Circles. Mandell demonstrated a tool designed to map relationships among the people Southey wrote to and about so that we might apply principles of network theory to confirm and challenge our views about Romantic sociability. Elizabeth Denlinger, curator of the Pforzheimer Collection at the New York Public Library, along with David Brookshire and Neil Fraistat of the University of Maryland, took us behind the scenes of the Shelley-Godwin Archive project, which among other things will bring Mary Shelley’s hand-written Frankenstein into public view. Thanks to these projects, crumbling manuscripts that were once available only to credentialed scholars will now be on line and, if all goes as apparently planned, open to all at no cost beyond an internet connection. For the most part, the people who spoke at the Keats-Shelley symposium are not emerging scholars trying to make their mark in a competitive field. Rather, they are accomplished professors who could easily have had a comfortable tenured existence in the ancien régime of print. They are acting on a vision of different possibilities, and their efforts represent the perfect Romantic paradox of conservation and radical change. They admitted challenges and risks, including: the high cost of “hidden labor” that makes these sites look deceptively easy, the frequent disconnect between technological ambition and resources, and the possibilities of unintended consequences. (Allusions to Frankenstein’s creature abounded.) But their generosity in opening their worlds and inviting others in with no fears of what Edmund Burke referred to as the “swinish multitude,” was beautiful and Romantic in all the best ways. When the speakers displayed a page of .html code, it no longer looked like Greek to me, but rather like a poetic language I wanted to understand and use. In designing a course that I called “Romanticizing Revolution,” I included a unit on today’s technology revolution at the center of the syllabus. It followed a unit on British texts from the period of the French Revolution and another on the American Sixties and preceded units on the so-called “Arab Spring” and the Occupy Movement. In her introduction to my course’s introductory text, Burke, Paine, Godwin, and the Revolution Controversy (Cambridge University Press, 1984-1992) Romantic scholar Marilyn Butler suggests that the revolutionary fervor apparent in England in the late 1700s “did not disappear but [went] underground” in the repressive 1790s and was transformed into polemical prose pamphlets and what we now call Romantic poetry. As my students and I read texts such as Eric Raymond’s essay “The Cathedral and the Bazaar” and Just for Fun: The Story of an Accidental Revolutionary by Linus Torvalds, the source behind open source software, I began to wonder whether code is our new Romantic poetry. In a manner analogous to Butler’s claim about the emerging print culture, the emerging digital culture marks the return of the revolutionary fervor of the 1960s and 70s after the backlash of the 80s. Although I hope to keep teaching Romantic literature, I will probably never write like William Wordsworth or Mary Robinson did. But this past week gave me a Romantic hope that I might one day, as a participatory DH-er, help produce some code that contributes to keeping the works of this period alive.